The first use of POW labor was the year before (1944) when 10 to 12 men were sent from the Windfall Camp to work for The Butterfield Canning Company. As this arrangement worked out so well, application was made thru the Indiana Canners Association to establish a Camp in Eaton for the following canning season. 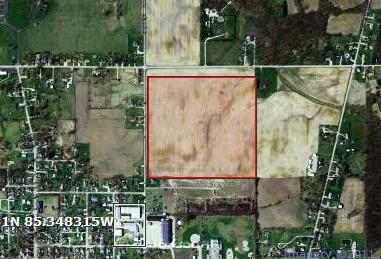 A land area of 17 acres was set aside for a camp area by Butterfield’s NE of the factory. A ten foot barbed wire fence was erected around the camp with guard towers being erected at the North East and South West corners. The towers were small large enough for only one guard but they did mount a machine gun which could cover the field area. The prisoners as well as the military were billeted in five man canvas tents. In addition a latrine, a small store and library were provided for the POW’s The prisoners were paid for each days work (80cents) and had the ability to spend the script that they were paid with in their small store. Due to the fear of escape the POW’s were not paid in currency. Only one individual escaped from the camp but returned a few days later on his own. When questioned as to his whereabouts while gone he stated that he had stayed with a woman in an adjoining town. 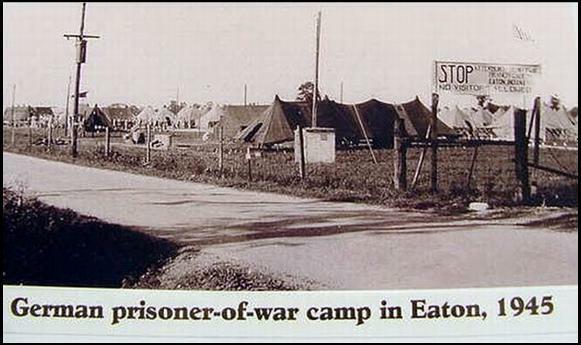 The men housed at the Eaton Camp were for the most part conscripted men who averaged 17-25 years of age. Several men were in their sixties and one youth only seventeen. He had been a paratrooper and had served since the age of 12. The Camp was commanded by 1st Lt. Lawrence J. Androit Jr. 1st Lt. William J Offerlie served as Executive officer. American enlisted guard strength was listed at 44. The seventh of September saw the addition of 100 German Officers. They were part of a new group of 1200 captured officers and included some Luftwaffe pilots. The Provost Marshal General’s office (records group 389) POW Information Bureau list condition reports as well as inspections and general administrative papers. The Camp existed until November 1, 1945 when it was disbanded due to the lack of workers needed and the winter weather. Remnants of the camp existed until 1976/77 when the last pieces were disposed.